A good way to collect family stories is to visit older family members in the quiet of their home and interview them. I have tried to collect stories at reunions and at other family events. However, there are usually too many distractions and people can’t think of stories. Reunions are great places to ask people to be interviewed later. When I visit a person’s home I take a digital camera. I take pictures of the family and their home. I also ask if they have any old photos or documents, e.g., letters, scrapbooks, old newspaper clippings, old military papers, or old family deeds that I could see. People are very reluctant to let you borrow these to copy and for good reasons. For a variety of reasons, people just can’t be trusted to return them. What I do is use my digital camera to take pictures of each old photo and document in full view of the owner. That way the owners never let their precious photos or documents out of their sight. I also take a digital recorder. Now many of you may remember the old tape recorders. The newer digital recorders are so much more compact and convenient. Sell that old tape recorder at a garage sale and buy a digital recorder. 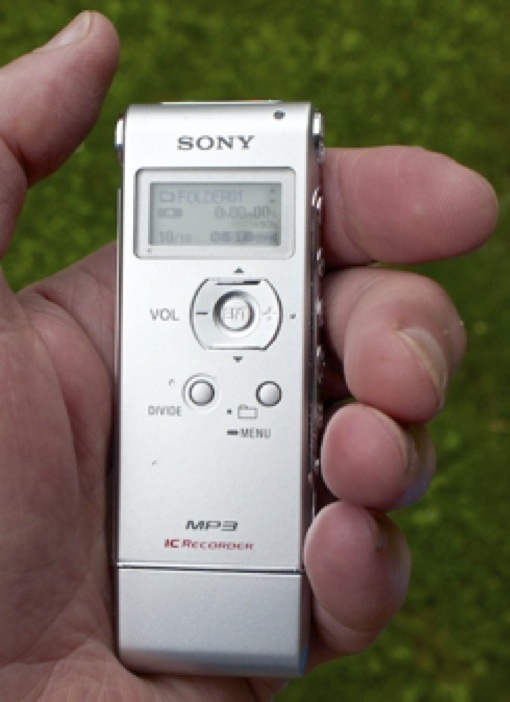 Below is a picture of my Sony IC recorder to show you how compact and small it is. And the digital sound quality is much better that the old tape recorders. Mine records in stereo and is capable of recording high quality sound more that 21 hours. That’s plenty of time for recording several interviews. In fact with such a large capacity, at family events I set mine in the middle of the dinning room table and let it record the whole dinner-time conversation. These digital recorders are sold at Staples and other electronic stores starting at about $40. You want one that records in MP3 format and plugs into your computer’s USB port. That way it is easy to transfer to your PC or Mac and you don’t need to perform any conversions on the digital sound format. The Sony Digital Flash Voice Recorder ICD-PX312 is a nice model with these features and sells on Amazon.com for about $50. Once you have the sound files in your computer, you can edit them and save them in your genealogy program. I usually ask for permission to record the interview. I show them the tiny digital recorder, press the “Record” button, and place the recorder nearby. No big microphone pushed in their face. In a few minutes, the person usually forgets that the tiny, nonintrusive digital recorder is there and starts to open up. Where did you live? Why did you move? What do you remember of your childhood? Any incidents with your brothers and sisters? Describe your childhood home. Any favorite pets? When and whom did you marry? What do you remember of your honeymoon? Did you always get along? Who are your children? When and where were they born? Where do they live? Were they a handful growing up? Where did you attend high school? Do you remember any funny incidents? Any school accomplishments you are proud of? Who was your favorite teacher? And Why? Describe your Senior Prom. Any sports? Did you attend college? Where and what major? What activities were you involved in? What parties do you remember? Did you ever get in trouble? Where were you employed? What did you do? Any accomplishments you are proud of? Were you in the military? Where were you stationed? Any funny incidents? Any scary moments? Which church (synagogue) do you attend? Were you active in any organizations? Which ones and what was your involvement? Did you go on any trips or travel? Describe your favorite place you visited. Any talents? Music, sports, dancing, hunting? What do you remember of your grandfather? What was grandmother’s cooking like? What was Christmas like at her home when you were a child? Any famous relatives in the family and why are they famous? I try to limit my interviewing to about an hour. Older people get tired easily. Later, I will play back my interviews and transcribe any interesting stories. Then I expand the story’s text by answering the standard who, what, where, when, and why questions to provide a context. Also, I will add further descriptive details to make the story more interesting.